Seven miles off the south coast of England, a near-force eight gale is whipping up some fearsome waves. “This wasn’t forecast,” shouts skipper Brian Kent as we struggle to remain upright on the pitching deck of his fishing boat. The weather is extreme, but still I grip my rod grimly, intent on my quest to catch something. 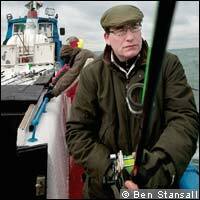 Sea fishing is at the macho end of the gentle art of angling. One of its thrills, though, is that when the rod tip bends over, it’s impossible to know what will be attached to the other end – the smallest mackerel or a monster from the deep. I am trying to realise a long-held ambition to catch a cod, the archetypal British sea fish. No one is better placed to help me than Kent, who knows these waters intimately. 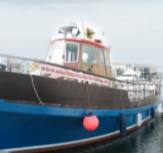 Based at Eastbourne’s Sovereign Harbour, he operates the largest fishing charter boat on the south coast. I was attracted to the 55ft-long Panther, a 50-year-old former Royal Navy dive boat that was used for clearing mines, both for its character and stability. It turned out to be a good choice. Although it is early in the season and some fish may still be spawning, a few cod have already turned up in catches this year. But as we ventured out of the harbour, Kent explained that the cod had yet to move inshore in any numbers as the cold winter had kept water temperatures down. There are seven anglers for this early-morning trip, so I’m hopeful one of us will connect with a hefty fish. We start about a mile offshore, within sight of the cliffs of Beachy Head, fishing double-hook rigs baited with lugworms and calamari over an area of rough sea bed. The tide is pushing through strongly, though, and combined with the strengthening wind, the Panther’s anchor is failing to maintain a hold. “I don’t hold out much hope,” warns Kent. I begin to wonder whether we should be saving some of the calamari in the bait bucket for tea. Kent isn’t giving up easily. He fires up the Panther’s engine and points the bow out to sea, headed for the wreck of a P&O liner called the Oceana, which sank in 1912. Rumour has it that thousands of pounds’ worth of silver bars are still somewhere in the tangled wreck. But we’re more interested in the other prizes that seek refuge in the ship’s sunken remains. Kent, a science teacher by profession, explains the locations of other wrecks and areas of rocks. He says most of the cod are still out in the channel, although dogfish and plaice are likely to be caught over the shallow, rocky ground. In the deeper water of the wrecks, cod are more likely, as are pollack or even the mighty conger eels. As we talk, the sea begins to appear less of a vast and featureless expanse. I can picture the reefs and rocky shoals, the shallows and the myriad wrecks that litter the ocean floor. Combined with fish movements affected by water temperatures, food availability and changing tides, it is an infinitely complex underwater landscape that makes fishing a supreme challenge. Heading further out, it is clear how wrong the weather forecasts were. Instead of the predicted force two to three, it is blowing five to six, and the Panther is rocking. Undeterred, Kent switches my rig to a string of mackerel feathers. Tying knots can be frustrating at the best of times, but on a rolling boat there is the additional hazard of skewering yourself on razor-sharp hooks. Approaching the wreck, Kent tells us to cast and jig the lures up and down in the water column, but the waves are doing the work for me. One second the rod is pointing at the sky, the next it is pointing at the water’s surface. And all the time I’m waiting for that electric-like jolt that will signal a fish. The wind is so strong that we drift on to the wreck in an instant. Kent barks instructions to reel up our lines a little to avoid snagging the wreck, and then to drop the lures back to the sea bed as we pass to the other side. The boat is moving so quickly, the fishing is frenetic. But the catching isn’t. The wind is approaching force eight by now and as we motor between marks, the Panther’s deck is at a 45˚angle. Waves are splashing on to the deck and breaking over the bow, showering the anglers back in the stern with spray. One of the party is looking distinctly green. The shore is a long way away now, and I am decidedly nervous. As the boat pitches to the side, my stomach turns over and I scan the others’ faces for signs of fear. I can’t remember the last time I wanted a fishing trip to end prematurely, but I do now. Still, Kent is not giving up. He drops anchor near a reef known as “the horse”, and instructs us to return to the bait rigs. As hope begins to fade, Kent’s own rod knocks and bends into a curve. 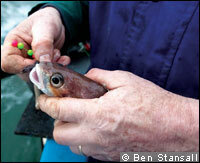 It’s no cod, though, but a small pout whiting. Kent seems a little embarrassed to have landed so small a fish, but in the circumstances I am happy to declare it a victory. 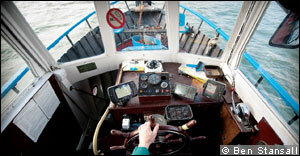 As we enter the calmer waters outside the harbour and the boat steadies, I feel a rush of exhilaration. No fish, maybe, but an exciting morning regardless. “I’m surprised you weren’t sick,” says Kent. He is frustrated by the conditions and invites me back to catch my cod later in the year. I am eager to return – I’ve found my sea legs, after all – and I’m sure I will land one next time. Article by Bob Sherwood. Copyright The Financial Times Limited 2010.